Using Mind Map Time Management techniques enable you to create whole brain To Do lists and will revolutionize the way you manage your tasks. 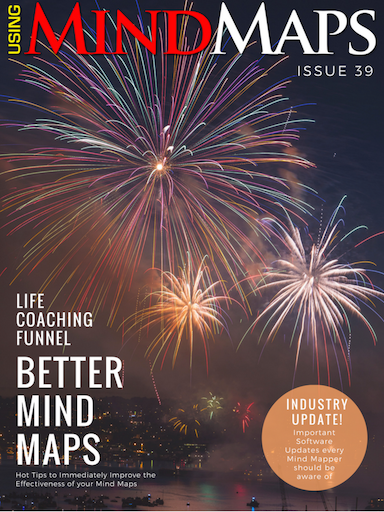 While this article is based on many sources, as well as personal experience, I would like to make a special mention of a book called 'Mindmapping' by Joyce Wycoff, which first introduced me to the concept. 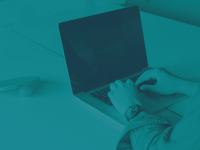 There are also lots more time management ideas to help you manage your time more effectively, besides the method described in this article. Feel free to explore what works for you. While this is fine for simple tasks, it often does not work for multiple tasks across the various roles one has to play in any given day. Some days you may only make the first three of your top ten for the day. If you are working on a daily system, you have to transfer everything to the next day. If you are on an open ended system, you scratch off the tasks you have done and renumber. Granted, this is much easier today with the advent of computers, but it could still look quite messy and has no structure. People buy organisers and time management systems and still find themselves approaching tasks haphazardly. The answer is because 'To Do' lists don't work the way we work. They are boring, black and white and not much fun! By Mind Mapping your 'To Do' list, you put yourself back into the process. Many people say that their 'To Do' lists feel like it's for somebody else. In fact, many people do them after the task has already been done! 'To Do' Mind Maps provide you with an organised structure and gives you an instantaneous view of where you are and where you are going. It's easy to add new tasks without destroying the organisation of your Mind Map, unlike a 'To Do' list. The method I am going to show you works well with pen and paper. 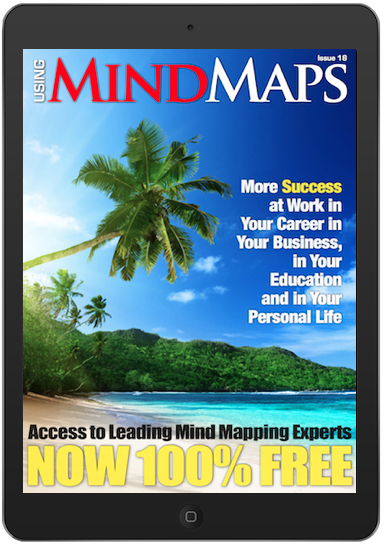 If you are using Mind Mapping software, it works even better. 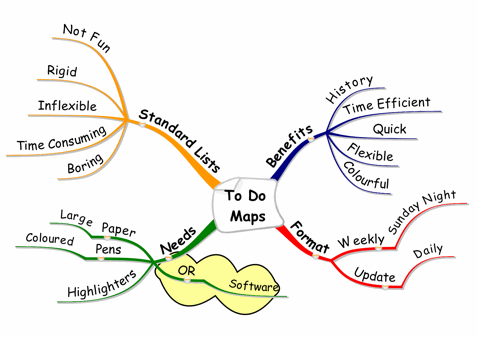 If you don't have Mind Map software, I suggest you try free Mind Mapping software such as Xmind, or Freemind so that you can perfect the Mind Map Time Management Method. 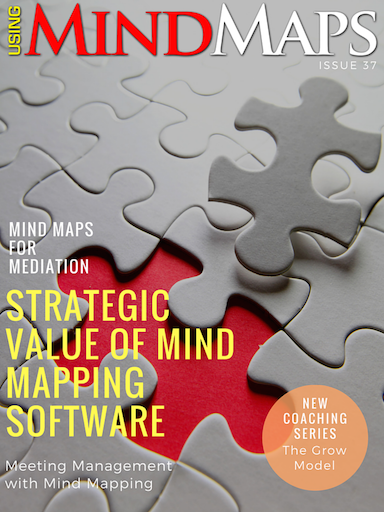 If you are not sure how to Mind Map, read some of our other articles, or even better, look at our Mind Map by example article. Take out a piece of blank paper, preferabley larger than A4, but A4 will do. Get a yellow highlighter and a pink highlighter. You'll see the reason for this soon. Draw a circle or rectangle in the middle of the page and write 'To Do' and the dates of the week in the box or circle. e.g. 'To Do - 4-10 May 2009'. A good time to do this is on a Sunday night, or first thing Monday morning. Update Daily. Draw a branch coming out from the centre and label it 'GOALS'. Think of the major groupings of your tasks. Draw a branch coming out of the centre for each of them, preferably in a different colour. I like to refer to this as 'Roles and Goals'. List the tasks you would like to achieve in each of these areas as sub branches coming off the main branches. Refer to the example below. You now have a pictorial view of all your tasks for the week on one page. All you have to do now is prioritise and manage your tasks. 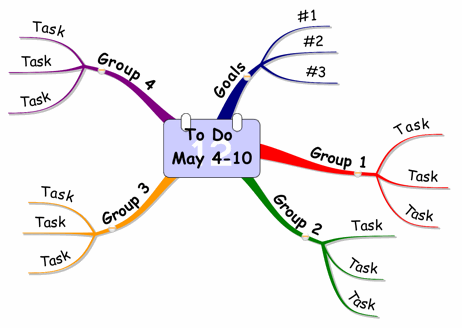 Mind Map Time Management is not some magical tool that automatically does your tasks for you. You still have to do the work and manage your tasks. Use this wonderful method to track and manage your tasks and stay focused on doing the right thing at the right time. Highlight all the tasks you would like to do for the day in YELLOW. You could also number them in order of priority if you feel you have to. You are now ready to start working through your Mind Map. Once you have completed a task, highlight it in PINK. This will create an orange branch, which 'fades' into the background. Doing this, you will be able to track what you still need to do and what has been done, while naturally preserving history with absolute clarity. This could be applied in many areas. A project manager could have branches for each of her projects. A salesman could have branches for presentations, follow ups, proposals and personal. A plant manager could have groupings of equipment, productivity, safetey and administration. Etc., Etc.